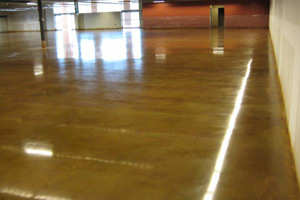 Southeast Floor Prep, LLC are your go to company for complete concrete preparation, staining, polishing, and coating services. We have been helping clients throughout Florida for over 10 years. We are the specialists in our field, you can trust our expertise and our craftsmanship. No job is too big or too small. We own all of our own equipment and only have in house personnel to complete our flooring projects. That means we can offer expert services at competitive prices. National restaurant chains and fortune 500 companies use us as their specialized flooring contractors, call now and speak with Don Talbot, our President, he may tell you who some of our clients are! We have grown considerably in the last 10 years by investing in the right equipment and the right staff. We recognize that down time can be expensive let alone a hindrance so we have worked straight through on many projects including aircraft hangers at West Palm Beach Airport and Mega Distribution Warehouses for many household names. A thorough surface preparation is just as important as the final coating or polishing process. By proper cleaning, grinding, shot blasting, or scarifying your old floors, we create a clean canvas to complete further resurfacing or decorative finishes. Concrete floors, when not properly maintained, can pit, crack, and rust. 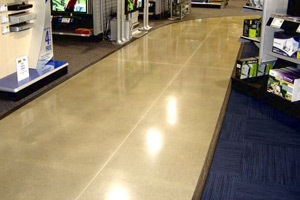 Specialty floor coatings can create the appearance of new concrete flooring, extend concrete life, and eliminate the need for expensive concrete replacement. Our concrete polisher equipment has been especially modified for Florida softer concrete. Your floors will have a high gloss stain and wear protectant for a clean look. Using more environmentally friendly chemicals than traditional acid based materials, we can create a variety of colors and finishes for exterior concrete surfaces. Diamond is the hardest element in the world, which is why we use diamond grinding when preparing and polishing concrete – it allows for fine control for beautiful finished surfaces.